Bly is an unincorporated community in Klamath County, Oregon, United States. By highway, it is about 50 miles (80 km) east of Klamath Falls. As of 2000[update], the population was 486. 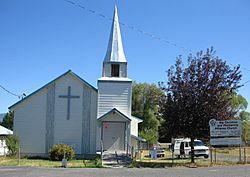 Bly is in southeastern Klamath County, slightly west of Lake County, along Oregon Route 140. By highway, it is about 37 miles (60 km) west of Lakeview and 50 miles (80 km) east of Klamath Falls. Fish Hole Creek, which flows through the community, meets the South Fork Sprague River slightly north of Bly. Fremont National Forest surrounds Bly except on the northwest. Gearhart Mountain Wilderness is about 10 miles (16 km) northeast of Bly. This region experiences warm (but not hot) and dry summers, with no average monthly temperatures above 71.6 °F (22.0 °C). According to the Köppen Climate Classification system, Bly has a warm-summer Mediterranean climate, abbreviated "Csb" on climate maps. The name Bly comes from the Klamath word p'lai, meaning "up" or "high", referring to its location up the Sprague River. A post office called Sprague River was established in the area in 1873, and the name was changed to Bly in 1883. At that time, the community was near the east end of the Klamath Indian Reservation. The 21st century community of Sprague River is downstream and west of Bly and Beatty. Around 1900, Bly had two general stores, two hotels, and a saloon. A history published in 1905 referred to the surrounding area as the "precinct" or the "valley" and estimated its total population at 750. The chief products of the valley at that time included cattle, horses, mules, and a few sheep as well as oats, clover, and hay. 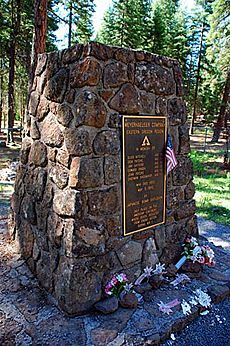 In 1935, the United States Forest Service acquired a 4-acre (16,000 m2) site in Bly for a district ranger station to manage the western part of the Fremont National Forest. The Forest Service paid $625 for the property. The ranger station was built by Civilian Conservation Corps workers under the supervision of Forest Service district ranger Perry Smith. The seven original buildings at the Bly Ranger Station were constructed between 1936 and 1942. A modern administrative headquarters building was added to the compound in the 1960s. The ranger station compound was listed on the National Register of Historic Places in 1981. Memorial to the Japanese balloon bomb victims. In 2002, Bly attracted national attention when Earnest James Ujaama was indicted and arrested for, in part, conspiring to set up a terrorist training camp on a ranch near Bly between October and December 1999. The indictment claimed that Ujaama was a follower of Abu Hamza al-Masri, and had ties to al-Qaeda and the Taliban. Ujaama pleaded guilty in 2007 to a single count of providing material support to the Taliban although the charge of attempting to set up a training camp in Bly was dropped. Abu Hamza al-Masri was convicted of this and other charges in 2014. In May 2009, Oussama Kassir was convicted for conspiring to assist in the camp's creation, based in part on testimony from Ujaama. The OC&E Woods Line State Trail, the longest linear state park in Oregon, passes through Bly. The 100-mile (160 km) rail trail was built on the roadbed of the former Oregon, California and Eastern Railway, which ran from Klamath Falls to Sycan Marsh. Bly, Oregon Facts for Kids. Kiddle Encyclopedia.